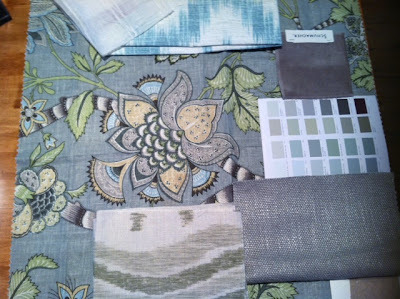 The Relished Roost: Back to the Design Board! Back to the Design Board! So many fabrics so little time!! Loving the leaf green and teal combo these days. Either toned down with some neutrals or popped with contrast! It's nice to find a client that likes that combination as well. So now I am gathering sample upon sample and trying to narrow down my absolute favorites, but I it is not easy because there are so many fantastic ones to choose from Here are my starters and I will post final boards when completed..now where is my coffee? I need to get back to work! 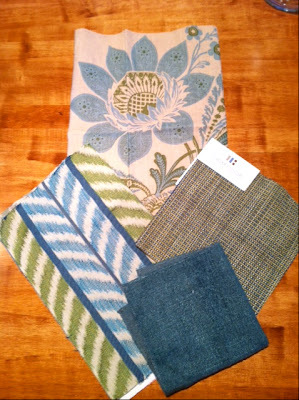 I love these accent fabrics for a brighter space with creamier staple pieces! Will do one serene board and one board that pops, always curious to see what the client is drawn to! I love this combo because of its taupe/gray basics with accent fabrics that have lovely serene pops of color! I would do F&B Elephant Gray with this combo for sure, stay tuned for final boards! Just found your blog! I am your newest follower! I love this fabric you posted about. Gorgeous blue combinations. Hard to narrow down - love all of these choices. Can't wait to see what you choose!! Ainsi, je découvre votre blog , avec de si belles photos de décoration. Je vois que nous avons aussi des goûts communs pour la couleur bleu. Je serais désormais une de vos lectrices.